The skeleton didn’t really eat anything. It would try to when Eric forced a piece of bread or a slice of carrot from his salad into its hand. The skeleton would look down at the food, its jaw open, its sockets staring. It couldn’t swallow, so whatever was in its mouth just fell over its pelvis and to the floor. Maybe it was the feeling of not being able to swallow that made it only try a few bites of whatever Eric offered. Maybe it was just that the skeleton knew it didn’t need to eat. Eric found it in the basement of the apartment complex. It wasn’t moving then. It was crumpled against itself, between two boxes of dirty clothing. Eric thought it would be fun to have in his apartment for Halloween. The first time the skeleton moved, Eric was drunk and thought of it as more funny than scary. The skeleton lifted its head from the couch and looked at Eric, which made him laugh so much that he needed to sit on the floor. The next day he asked the skeleton if it felt pain, and it responded by putting its fingers through the space between its ribs. He asked the skeleton if it slept, and it opened and closed its jaw. Eric asked if it wanted a pillow, and it did the same thing. Having a living skeleton on the floor while he slept in bed reminded Eric of his family dog. Falling asleep to the sound of its teeth clicking together was more comforting than he imagined it might be. After a few weeks the skeleton seemed bored. It turned its head from side to side, ran its hands across the floor, and sometimes clamored its foot against the coffee table when Eric left it propped up on the sofa. Once Eric came home and found the skeleton on the floor far away from where he had left it. One of the roommates told Eric it was tapping on the coffee table so loudly he got frustrated. The skeleton stared at Eric’s roommate, even as Eric picked it up to put it into his room. Sometime in the night, his roommate packed up, leaving a note on the door that explained how he couldn’t stand it and he thought it’d be better for everyone if he left. Eric tried calling on his cell but he didn’t pick up. Eric showed the note to the other roommate when he woke, and they decided the first roommate had been drunk, and maybe he’d come back after realizing there really wasn’t a good reason to leave. Eric walked back into his room to find the skeleton in a chair rather than on the floor. It turned to face Eric when he came in and clicked its teeth in greeting. Eric waved and told it one of the roommates had moved out because of it. The skeleton ran its fingers along its ribs and shrugged. A few days later, the skeleton started smelling bad. Eric put it into a bath, which the skeleton seemed to enjoy. It felt heavier when Eric lifted it into the tub, and he suspected that either his attempts to feed it or his other roommate’s own attempts resulted in food bits getting stuck on its interior bones. As he scrubbed he talked to it, explaining the smell and that he wasn’t angry. The skeleton pointed to its teeth and lowered its jaw. The skeleton was getting stronger. At night Eric heard it crawl to different parts of his room. The skeleton once opened up the door to the bedroom and Eric saw it standing. He asked the skeleton how long it was able to stand up, but it just turned, saw Eric was awake, and lay back down on the carpet. A few days later Eric’s second roommate moved out. Again, it was in the middle of the night, but this time the roommate hadn’t bothered packing anything from his room. It looked like he’d planned to pack but didn’t get past opening all of his drawers and putting his clothes on the bed. He left a note, too, and it read the same way as the first roommate’s note. 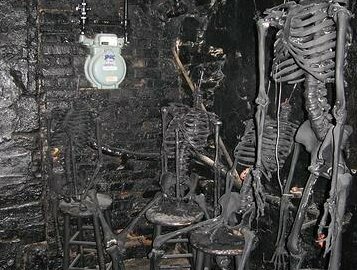 Eric decided to return the skeleton to the apartment complex basement. He waited until it was facing away from him and threw a blanket over it. The skeleton didn’t put up a fight, and by the time he reached the basement, it felt completely inanimate. Eric put it between heaps of clothing. He recognized his roommate’s shirt. He decided to lock the basement door as he left. Things were quiet then. Eric cleaned up both of his roommates’ old rooms—simply throwing out the one roommate’s clothing rather than putting it into the basement. He locked the apartment door as well as his own bedroom door, hoping that securing them would allow him some sleep. Eric only dreamed he heard someone testing the front door. Eric only imagined the sound of shoeless, fleshless steps in his apartment. It was only his paranoia, Eric thought, which made him believe that he saw the skeleton in his bedroom a week later. But as it shambled over to him, leaned in, and bit hard on his shoulder, Eric knew he wasn’t imagining anymore. As the skeleton held him down and chewed his flesh, Eric knew it was real. Matthew Kabik’s work has appeared in Five Quarterly, Nib Magazine, Structo Magazine, The Fat City Review, and Literary Orphans, among others. He has work forthcoming in Pea River Journal, Whiskeypaper, Gravel, and The Story Shack. Follow him on Twitter @mlkabik.